The Society has a developing publications programme. 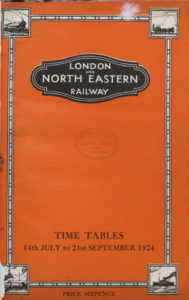 In furtherance of its aim to make accurate information about the LNER more widely available, many of these publications are offered for sale to members and non-members alike. Amongst the items available are facsimile Carriage Working Books from the 1930s and 1940s covering most areas of the LNER system and the proceedings of the two Symposia held in 2008 and 2010, both in hard copy. Also available are digital copies of working timetables and public timetables ranging from the early 1920s onwards throughout the LNER period. More of these are in preparation and the listing below will be updated as new items are made available. Some items are available for sale to members only such as the pin badge, LNER Magazine 1927-1947, NER Magazine 1911-1926 and the BR(E) Magazine 1948-1963 on DVD. It is worth noting that members get a 33% discount on prices and free postage, another very good reason to join us! 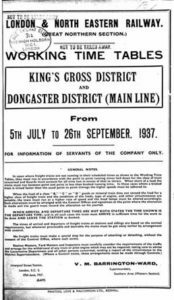 LNER Working Timetable (GN Section), King’s Cross and Doncaster Districts Main Line. Summer 1937 – Both this and the 1924 Public Timetable are available as digital copies. Mainline Carriage Working and Instructions for Loading of Vans.